Fear of what? Rejection, failing? A husband can hesitate to be affectionate with his wife in fear of his partner rejecting his touch. A son can be afraid to tell his dad he loves him in fear he won’t say it back. A woman may be afraid to go on a date in fear of being thought of as ugly. 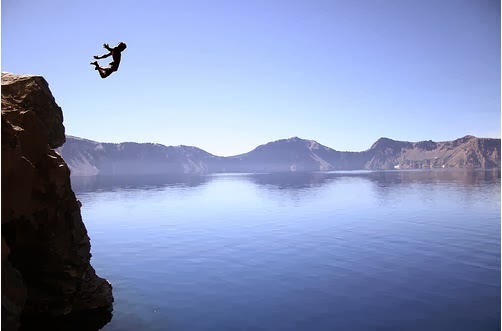 When a man jumps off a cliff into a quarry of water, he may get a running start. The fear is in the beginning. Will he land safely? Even in the run he must not think. And there is a point, that moment when both feet have left the ground and he is no longer in control. Exhilaration. Wonder. Doubt. After resurfacing, feelings of exhilaration, wonder, and joy amounts. It is only then when he can be grateful for loving, for losing fear. For taking the moment out of his control and into the air.